I made a big change to this website this morning, by converting all comments to Google+ format. Trying to make this place more smartphone/tablet friendly. Connecting with you is my first priority. I can post up all these pictures and tell you about all these great places. If nobody looks at it or even better, leaves a kind comment. What are all the endless hours of editing worth? Screenshot from one of my readers, shared on social media. Thanks Dave. The best way to connect with someone is in person. I find the greatest way to do this is by meeting people on the trail, bus or hitchhiking (own risk). There are no substitute for a real conversation with a human. However, the internet is a great way to connect with mass numbers from all over the globe. Seeing the opportunity in this, is the only thing keeping me motivated to input content on this site. Means a lot when someone overseas enjoys the site or a local hiker uses it a resource to get area conditions. A website with fresh content has many uses in this day and age. For this reason I have been working on simplifying this site, with the goal of making it easier for you to interact with me. Today I took a chance and converted all the comments to Google+ format. By doing this, all archive comments through the last few years will no longer be viewable. Looking to the future, hope this choice was a good one, but only time will tell. Feel free to leave me comments on any of the content you feel worthy. Your feedback is what keeps me going through all the countless hours of editing photos, video and text (need help there). I have been redirecting this site to be more about my reader and less about, 'hey, look at me'. Without you, this site is just a box full of empty cobwebs. Goal of bringing you with me on the journey. Having you right there in the moment, whether it be good or bad. Always emphasising pure wilderness over man. Enjoying the moment and focusing on the little things. That is what being outside is all about. Mount Baker above a sea of marine layer at sunrise. I would really like to see this site grow into helping people walk better, pack less and learn self reliant skills. Mainly improving people posture while walking and helping them move forward more efficiently, with less effort. This also means only using footwear that are Zero Drop (toe and heel are equal distances to the ground) to form a balanced foundation. Secondly, break hikers bad habits on the dependency of Trekking Poles. These things are the second most cause of bad posture to someone in the outdoors. Leading to bad knees and back in the future. When you think about it. Using sticks, just to walk forward? Sounds kinda silly huh? Have all this content in my head, but to put it all into words is not an easy task for me. Working on other ways to connect with you. Perhaps a webstyle workshop in the future? I will start rolling out my web series in the next few weeks. These photos are a connection of routes that took place from mid-June to early October 2013. Having the goal of hiking from snow melt to snow falling again. 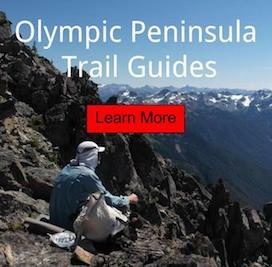 This is a great way to show off the diversity of the Olympic National Park as the seasons change. Its unbelievable! My personal journey will be shared, including rugged coastlines, rainforest, multiple glaciers, peaks of the interior and then unfortunately a helicopter rescue. Time was spent off the trail to heal my foot. Then I revisited the area of concern (from a distance) and faced my mental demons. Shortly after that, spent time in the backcountry with a group of friends for a week, followed by a 10 day high alpine traverse of the park; completely breathtaking. Once the Park reopened, I walked from the mountains, back to the ocean.